As fate willed, Andrei Dmitrievich Sakharov became a phenomenon on a global scale. He wrote: "My destiny was exceptional. Not because of false modesty but because of a wish to be accurate I note that my destiny has turned out to be larger than my personality. I've simply tried to live up to my destiny." The excerpts from his memoirs, the recollections of others, the documents and photographs on view at the Andrei Sakharov Museum and Center in Moscow are an attempt to explain something of his extraordinary life. "I have written about events and impressions of my life, about relatives and friends and about others whose role has been significant, about the ideas that have influenced my life, about my scientific and public activities. I have been a witness and a participant in events of great importance, and I want to record them." 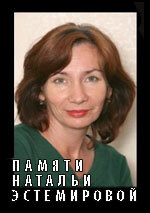 Sakharov's mother, Ekaterina Sofiano, was the daughter of Alexei Sofiano, a professional soldier and nobleman. Sakharov's maternal grandmother Zinaida Mukhanova was a descendent of a noble Tatar family. Three generations on Sakharov's father's side were Russian Orthodox priests, but Sakharov's grandfather Ivan Sakharov became a lawyer. He was an editor of the anthology Against the Death Penalty (first published in 1905). As a child Andrei Sakharov read this book never thinking that later he himself would carry on the fight against capital punishment. Sakharov's father, Dmitri, taught physics at the Bubnov Pedagogical Institute and was an author of textbooks and popular scientific works. I spent my childhood in a large communal apartment shared by four Sakharov families, as well as two other families, in relative harmony. The spirit of a big traditional family reigned there -- zeal and respect for work, mutual family support, love for literature and science." Sakharov remembered summers spent in the country, hide-and-seek, and books of Pushkin, Jules Verne, and Hans Christian Andersen. Sakharov was home schooled until the age of 13 when he was admitted into the seventh grade (equivalent of American ninth grade) of the Third Model School. In 1938 Sakharov enrolled in Moscow University's physics department. In 1942, Andrei Sakharov graduated from Moscow University with honors. As an exceptionally talented young physicist, he was invited to continue his studies in theoretical physics. Sakharov refused, because he wanted to participate in the war effort. Sakharov was sent to work at the Ulyanovsk military plant which was producing armor-piercing bullets. Sakharov took great pride in his invention of a device to test the hardness of the bullets' cores, an invention which earned a 3,000 ruble bonus for Sakharov. Sakharov met his first wife Klavdia Vikhireva in the Ulyanovsk factory, where she worked as a laboratory assistant in the chemistry department. "We lived together for almost 26 years before Klavdia's death on March 8, 1969. We had three children: our elder daughter Tanya, born February 7, 1945, Lyuba, born July 28, 1949, and Dmitri, born August 14, 1957. Our children brought us a great deal of happiness, and, like all children, problems, too. There were happy periods in our life that sometimes lasted for years, and I am grateful to Klava for them." In 1945 Sakharov returned to Moscow and began graduate studies at the Lebedev Institute of Physics (FIAN) under the direction of Igor Tamm, 1958 Nobel Physics Prize winner. Tamm's personal qualities - his absolute intellectual integrity, his courage, his willingness to recognize mistakes, his readiness to help people, his approach to social questions and his belief that "the most important thing in life is to create, to do something constructive," strongly influenced Sakharov, who emulated these traits in his own life. Shortly after Sakharov returned to Moscow, World War II ended. "On my way to the bakery on August 7, 1945, in I stopped to glance at a newspaper and discovered President Truman's announcement that at 8 a.m. the previous day, an atom bomb of enormous destructive power had been dropped on Hiroshima. There could be no doubt that my fate and the fate of many others, perhaps of the entire world, had changed overnight." 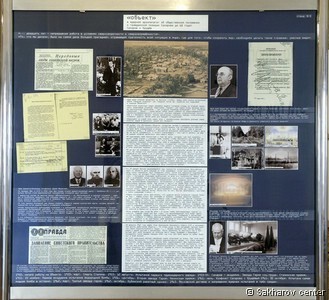 In November 1947, Sakharov defended his thesis ahead of schedule. Tamm commented that the "originality that distinguishes his thesis and many of his talks proves that Andrei Dmitrievich has been given much and we can expect much from him…." 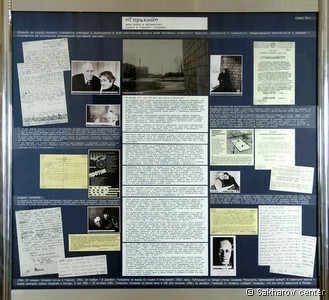 In June 1948, Sakharov was included in the group investigating the possible building of a hydrogen bomb. For a long time American and Russian physicists were unable to create a practical "device." Sakharov proposed a new, unexpected design for a bomb, which was called a "Sakharov layer cake." In 1950, he was transferred to the secret "Installation," located on the site of the former village of Sarov, for work on atomic weapons. In August 1953, the test of the first Soviet thermonuclear device, which used Sakharov's layer cake design, was a success, and Sakharov became a member of the Soviet scientific elite. He was awarded the Hero of Socialist Labor medal three times (in 1954, 1956, and 1962), a Stalin Prize (1953) and a Lenin Prize (1956). In October 1953, he was elected a full member of the USSR Academy of Sciences at an exceptionally early age. Sakharov in his Memoirs described his approach to the moral questions associated with his work. "I understood the terrifying, inhuman nature of the weapons we were building. But the recent war had also been an exercise in barbarity; and although I hadn't fought in that conflict, I regarded myself as a soldier in this new scientific war. We devised or borrowed a number of principles, including strategic parity and nuclear deterrence, which even now seem to justify, at least to some extent, the creation of thermonuclear weapons and our role in the process. Our initial zeal, however, was inspired more by emotion than by intellect. We were possessed by a true war psychology … From the late 1950s I was becoming increasingly concerned with the biological effects of nuclear weapons tests and began to fight for ending or at least limiting them. Because of this, in 1961 I came into conflict with Khrushchev…Each and every nuclear test does damage. Halting the tests will save hundreds of thousands of lives, and it should reduce international tension and the risk of nuclear war." In autumn 1962, despite Sakharov's efforts, the Soviet Union tested two powerful and very similar thermonuclear devices because of competition between the two Soviet nuclear weapons centers. In his memoirs, Andrei Dmitrievich wrote: "A terrible crime was about to be committed, and I could do nothing to prevent it. I was overcome by my impotence, unbearable bitterness, shame and humiliation. I put my face down on my desk and wept. I decided that I would devote myself to ending biologically harmful tests." 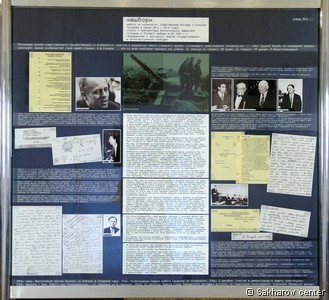 Sakharov was proud that his advocacy played a role in the adoption of the 1963 Moscow Treaty Banning Nuclear Weapon Tests in the Atmosphere, in Outer Space and Under Water. Tests continued but were conducted underground. In 1950 Sakharov, together with Tamm, developed the idea of a magnetic thermonuclear reactor (a tokamak), which remains the favored approach for using fusion to produce energy commercially. In the1960s, Sakharov published significant papers on cosmology, gravitation, and the physics of elementary particles. "In the late 1950s and especially in the 1960s, social problems increasingly attracted my attention. They compelled me to act, reducing the time I could spend on other things, even science." In 1964, Sakharov spoke out forcefully at the Academy of Sciences against the election of Nikolai Nuzhdin, who was an accomplice in Trofim Lysenko's pseudo-scientific agricultural schemes. In 1966 he signed a joint appeal against the rehabilitation of Stalin and sent a personal letter to the chairman of the RSFSR Supreme Soviet opposing a law that opened the way for the prosecution of many more dissidents. "Since 1966 I have sent many letters and telegrams to officials. With few exceptions, these efforts have produced little in the way of immediate results. But I believe that statements on public issues are a useful means of promoting discussion, proposing alternatives to official policy, and focusing attention on problems. Appeals on behalf of specific individuals also attract attention to their cases, occasionally benefit a particular person, and inhibit future human rights violations through the threat of public disclosure." In 1968, Sakharov wrote his remarkably influential essay Reflections on Progress, Peaceful Coexistence, and Intellectual Freedom. In it, he examined the global problems that threaten humanity. He put forward the thesis of "the convergence of the socialist and capitalist systems, accompanied by democratization, demilitarization, and social, scientific and technical progress as the only alternative to the death of mankind." 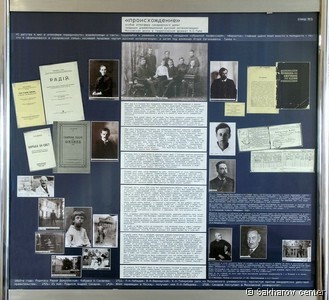 In Russia, the essay circulated in samizdat; abroad it was published in editions totaling 18,000,000 copies and widely discussed for several years. Sakharov was barred from weapons work after the July 1968 publication of Reflections. In May 1969 he was reinstated in FIAN's theoretical department with the title of Senior Scientist. 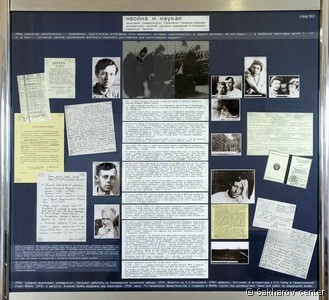 While still working at the Installation, Sakharov had made the acquaintance of Zhores Medvedev, Zhores's twin brother Roy, and a few other "dissidents," but Sakharov's involvement with the dissident world grew quickly after his return to Moscow and his wife's death from cancer in March 1969. KGB surveillance of Sakharov intensified  in May 1970, the Central Committee approved the KGB's request to install listening devices in Sakharov's apartment. In November 1970, together with the young physicists Valery Chalidze and Andrei Tverdokhlebov, Sakharov founded the Moscow Human Rights Committee, the first independent association in the Soviet Union to receive international recognition. 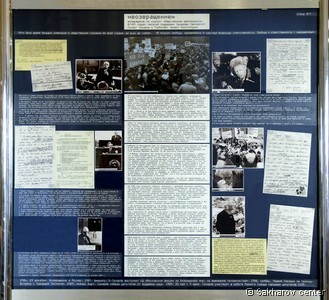 Sakharov began to attend trials of dissidents. He joined the December 5 Pushkin Square demonstrations. In 1972, he collected signatures on appeals for an amnesty and against capital punishment. On January 7, 1972, Sakharov married Elena Bonner (called Lusia by Sakharov), whom he had met while attending the trial of Revolt Pimenov in October 1970. In the epilogue to his memoirs, Sakharov wrote: "Truly Lusia is the only person who shares my thoughts and feelings. Lusia prompts me to much that I would otherwise miss because of my restrained personality, and to act accordingly. She is a great organizer, and acts as my brain center. We are together. This gives life meaning." 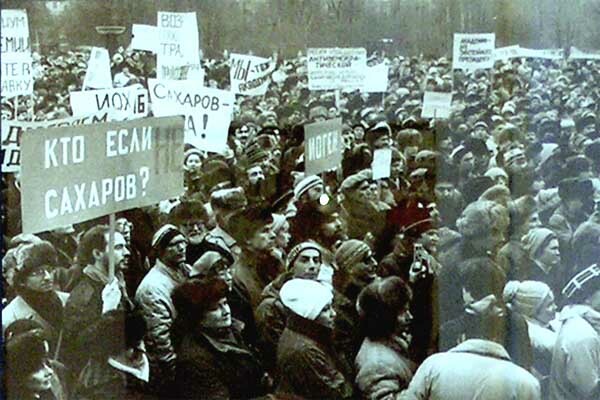 After Sakharov's outspoken interview with Olle Stenholm was broadcast in July 1973, a storm of abuse was launched against Sakharov, culminating in a letter to Pravda signed by 40 members of the Academy of Sciences. 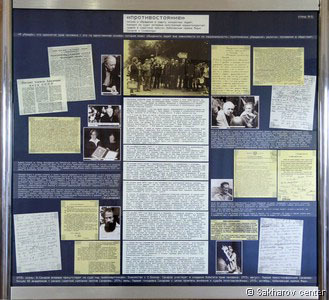 More letters in the Soviet press denouncing Sakharov followed, while Alexander Solzhenitsyn and several other dissenters in the Soviet Union publicly expressed support for Sakharov. Andrei Sakharov was awarded the 1975 Nobel Peace Prize for his "fearless effort in the cause of peace." Elena Bonner accepted the prize on Sakharov's behalf, since he had been denied permission to leave the USSR, and on December 11 in Oslo, she read Sakharov's Nobel Lecture, which argued that "international trust, mutual understanding, disarmament, and international security are inconceivable without an open society, freedom of information, freedom of conscience, the right to publish, and the right to travel…We need reform, not revolution. We need a flexible, pluralist, tolerant community prepared to make free, undogmatic use of the experiences of all social systems." After Bonner returned to Moscow, she and her children suffered various forms of harassment. In September 1977, her children and grandchildren emigrated to the United States. Soviet troops invaded Afghanistan on December 24, 1979. On January 3, The New York Times published an interview with Sakharov in which he called for the withdrawal of Soviet armed forces from Afghanistan. On January 8, 1980, the Presidium of the Supreme Soviet adopted two decrees: "The Administrative Expulsion of Sakharov from Moscow" and "Revoking Sakharov's State Awards." On January 22, Sakharov was arrested and banished to Gorky, an industrial city officially closed to foreigners, not far from the nuclear weapons center where Sakharov had worked. In Gorky, Sakharov and Elena Bonner were assigned a comfortable apartment and were free to move about the city, but they were kept under continuous surveillance and Sakharov was not permitted to travel beyond the city limits. His only reliable connection with the outer world was Bonner, who made 100 roundtrips to Moscow before she was arrested in May 1984, convicted of slandering the Soviet state, and sentenced to five years' exile in Gorky. FIAN occasionally sent scientists to Gorky to brief Sakharov on recent developments in physics. Three papers by Sakharov on cosmology were published in the Soviet Journal of Experimental and Theoretical Physics while he was in exile, but the Academy of Sciences rejected his appeals for assistance. He kept abreast of world events and foreign reactions to his plight by listening to shortwave news broadcasts. He wrote several hundred pages of memoirs despite repeated KGB thefts of his manuscripts, and he continued to issue statements on Soviet human rights violations and other public issues, including his controversial and influential 1983 essay "The Danger of Thermonuclear War." Sakharov had conducted a brief hunger strike in June 1974 to call attention to Soviet political prisoners. In Gorky, Sakharov and Bonner began a joint hunger strike on November 19, 1981, to secure an exit visa for Liza Alexeyeva, who had been married by proxy to Bonner's son, Alexei Semyonov. After an avalanche of publicity in foreign media, the KGB capitulated on December 8, and Liza was granted an exit permit. From May 1984, for an astounding total of 178 days, Sakharov conducted a series of hunger strikes, with intermissions and periods of forced feeding, in order to gain permission for Bonner to go to Boston for heart surgery. Bonner finally received the KGB's grudging permission for her trip in October 1985. She arrived in Boston on December 7, had bypass surgery on January 14, and was reunited with Sakharov in Gorky exile on June 4. In 1985 Mikhail Gorbachev was elected Secretary General. In 1986, Sakharov wrote to Gorbachev twice, calling on him to free political prisoners and seeking release from exile. At a November 10, 1986, meeting of the Politburo, Gorbachev proposed that Sakharov and Bonner be allowed to return to Moscow. On December 9 the Central Committee annulled the decree banishing Sakharov from Moscow and pardoned Bonner. On December 16 Gorbachev called Sakharov and invited him to return to Moscow and to "patriotic work." On December 23 Sakharov and Bonner 'stepped off the train at Moscow's Yaroslavl Station onto a platform teeming with reporters from all over the world," ending almost seven years of isolation. The three remaining years of Sakharov's life were extraordinarily active. Many Soviet citizens viewed him as the unofficial leader of the democratic movement despite his disclaimer of any political ambition and his insistence that he represented only himself. For the KGB, he remained "a generator of ideas for the opposition." In February 1987, Sakharov took part in the Moscow "Forum for a Nuclear-free World and the Survival of Mankind." In December 1987, Sakharov agreed to chair the Academy's Commission on Cosmomicrophysics, and in October 1988 he was elected to the Academy's Presidium. In 1988, Sakharov was elected to the board of the Memorial Society. In November - December 1988, he visited Boston, New York, Washington, and Paris, and met privately with President Reagan, President-Elect Bush, Secretary of State Shultz, Prime Minister Thatcher, and physicist Edward Teller, President Mitterand, UN Secretary-General Perez de Cuellar and Lech Walesa. In April 1989 Sakharov was elected to the First Congress of People's Deputies. At the Congress, Sakharov declined nomination to the Supreme Soviet. He did, however, accept election to the five-member governing board of the Interregional Group of Deputies, a parliamentary caucus of reformers, and also appointment to the commission tasked to draft a new constitution. In November 1989, Sakharov presented Gorbachev with his preliminary draft of a Constitution of the Union of Soviet Republics of Europe and Asia. On December 12, 13 and 14, 1989, Sakharov participated in the second meeting of the Congress of People's Deputies. After the December 14 session, Sakharov returned to his home, ate a hasty meal, and retired to his study to prepare for "tomorrow's battle" in the Congress. Two hours later, his wife found him dead. During the four days of national mourning that followed, tens of thousands of Soviet citizens paid tribute to the brave and brilliant man who had done so much to restore their faith in themselves and to repair the fatal breach between state and society. What kind of person was Andrei Dmitrievich Sakharov? A shy and a modest man, who liked washing dishes, who gave flowers to his wife, who knew and loved the poetry of Pushkin and Blok. A world famous physicist, who was father of the Soviet H-bomb and also initiated the most promising idea for using nuclear fusion to produce energy for peaceful purposes; an author of important works on cosmology and elementary particles. A social and political activist, an intellectual and moral leader who linked progress, intellectual freedom, international security, and human rights. Different people saw different aspects of Andrei Sakharov. But everyone felt the strength of this man. Keldysh, physicist, academician of the Russian Academy of Science. 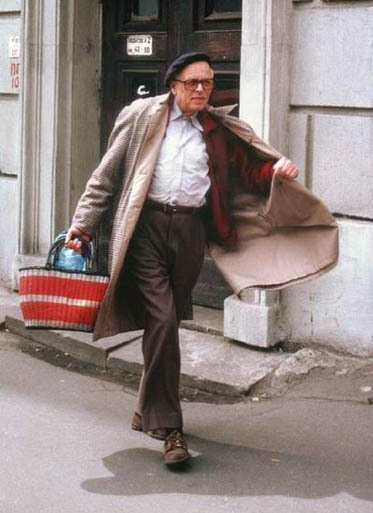 "My short acquaintance with Sakharov made me think that he was an optimist... In the conditions in which he lived, one needed immense spiritual strength to be optimistic. He did much for conflict resolution between East and West." Edward Teller, American physicist. "Andrei Dmitrievich was able to feel other people's pain with his skin. This supreme talent meant that he was never indifferent to human suffering." Sergei Kovalev, human rights advocate. Митинг у здания Президиума Академии наук. The Andrei Sakharov Museum and Public Center 'Peace, Progress, Human Rights'. 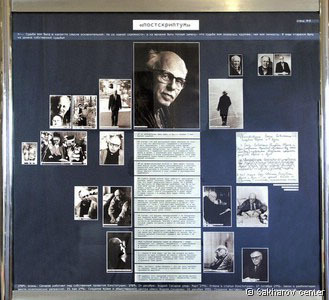 About the Andrei Sakharov Museum and Public Center. Mythology and Ideology in the USSR . Political Repressions in the USSR . The Road Through the GULAG . Resistance to Unfreedom in the USSR . Personality and destiny of Andrei Sakharov. Sakharov Prize 2009 awarded to Memorial.